Relax in comfort in the adaptively restored 1923 Coast Guard Lifeboat Station Crews Quarters offering five themed rooms. Included in your stay is a Continental Breakfast. 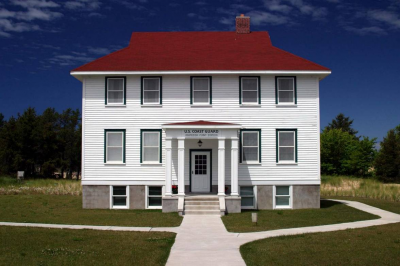 Your donation grants you admission to the Great Lakes Shipwreck Museum and Whitefish Point Light Station, and a 10% discount in the Shipwreck Coast Museum Store. No additional charges for double occupancy or extra lodging taxes. A portion of your donation is tax deductible. Please note that during the month of April while the Crews Quarter Building is open for overnight guests, the Shipwreck Museum will be closed. Second floor (corner room) view of the Whitefish Point Lighthouse, Museum complex, and the southwest sky. This room is reserved for this date. Second floor (back corner room) - enjoy the scenic view of the forested sand dunes and the southwestern sky. Depending on the season and summer vegatation, you may be able to see Lake Superior through the forested sand dunes. You may see freighters passing by (from this second floor corner room) along with other marine vessels. This room faces Lake Superior along, with a view of the Whitefish Point Lighthouse Tower. You may see freighters passing by (from this second floor corner room) along with other marine vessels. This room faces Lake Superior along, with a view of the Whitefish Point Lighthouse Tower and Museum Complex. First floor room with a private picturesque view of the forested sand dunes.